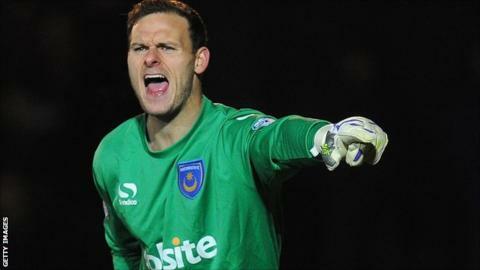 Portsmouth keeper Trevor Carson says the squad lack leadership, accusing his team-mates of having no 'fight'. Pompey were beaten 2-0 by Newport County on Saturday as they continue their slide down League Two. Richie Barker's side are now only four points off the relegation places and are without a win in eight games. "There are some big, strong players in the squad but we seem scared to fall out with each other which is nonsense," Carson told BBC Radio Solent. Two goals in three minutes from Mike Flynn gave County victory and Carson bemoaned his side's capitulation. They have now lost six of their last eight games, conceding a total of 17 goals in the process. "It's baffling," he added. "We were in control. We seem to drop our heads whenever we concede a goal. "It very rarely I've been beaten by a wonder-strike. Every goal has been preventable and that makes it even more frustrating." Carson believes a lack of confidence is partly to blame for their slump, but says a lack of leadership and character is largely responsible for the poor run. "We just don't seem to have that player on the pitch who, whenever we concede a goal, can go up to someone and grab the lads. "The heads drop, the crowd get frustrated and it affects the lads. We have to be bigger than that. "Why can we not be leaders? We need to roll our sleeves up and maybe have a fight with each other." Meanwhile, the club's current assistant manager and physio Steve Allen is set to leave the club, reports BBC Radio Solent. Allen was appointed in May by former Pompey boss Guy Whittingham, but will now leave Fratton Park due to the arrival of Barker.